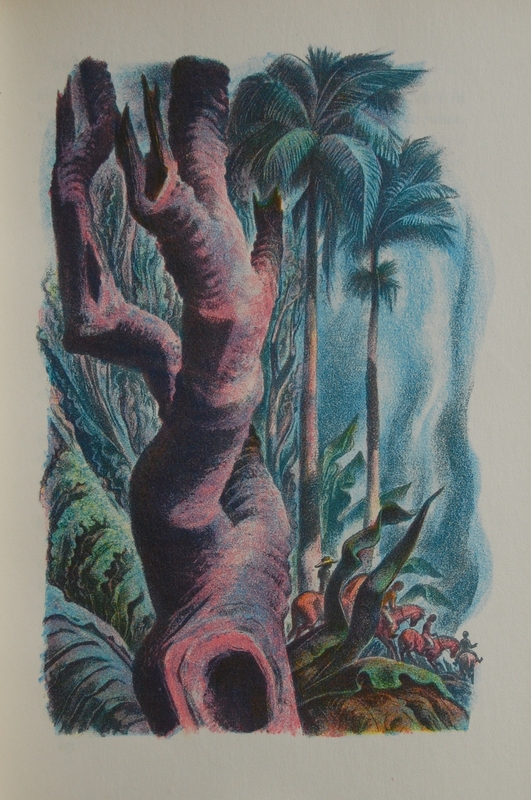 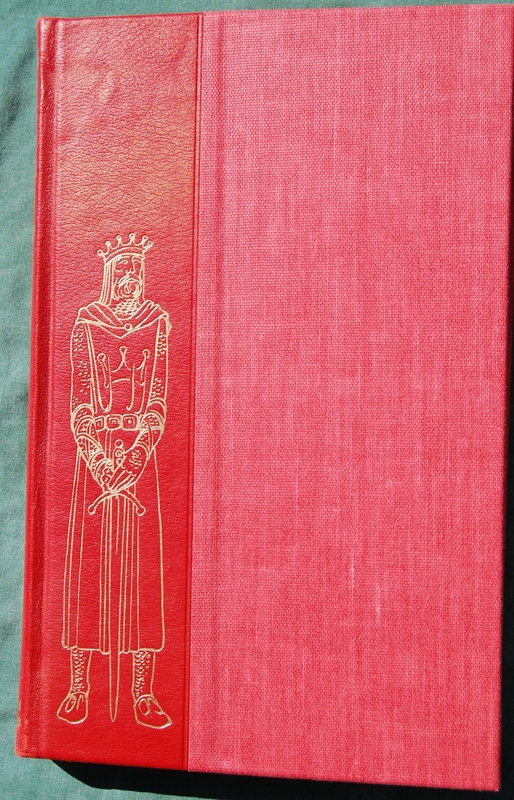 Originally a Hertiage Press exclusive, later reprinted by the Limited Editions Club in 1952 (Book #225, 21st series V. 5). 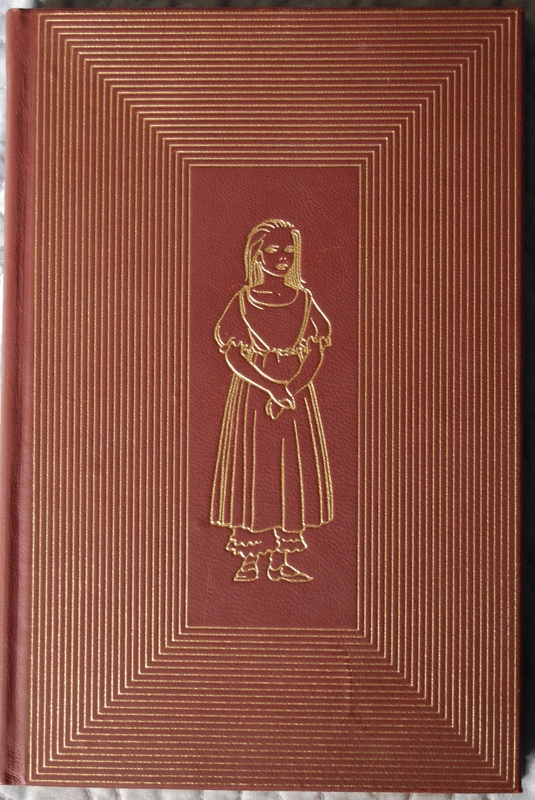 Front Binding – Designed by John S. Fass, these boards were covered by a binder’s linen that was left intentionally rough, dyed several shades of brown. 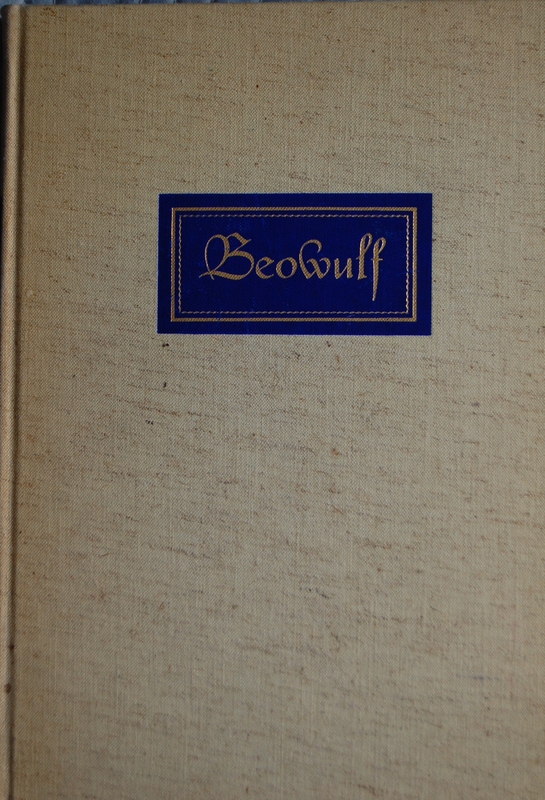 The bold blue foil box that surrounds Beowulf‘s title was stamped into the linen, with the gold pressed into that. 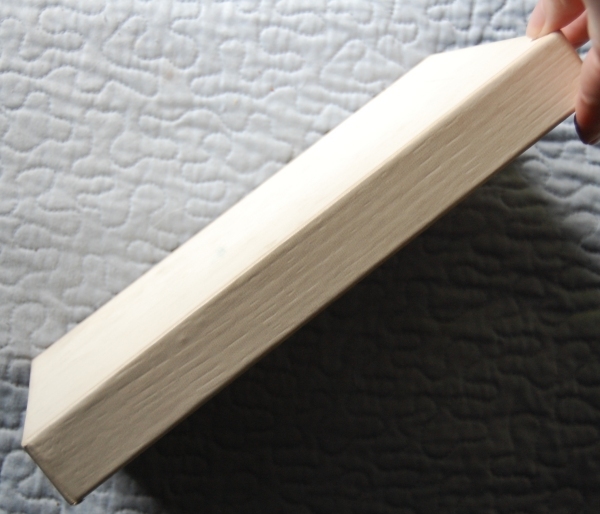 The spine repeats the idea, albeit smaller. 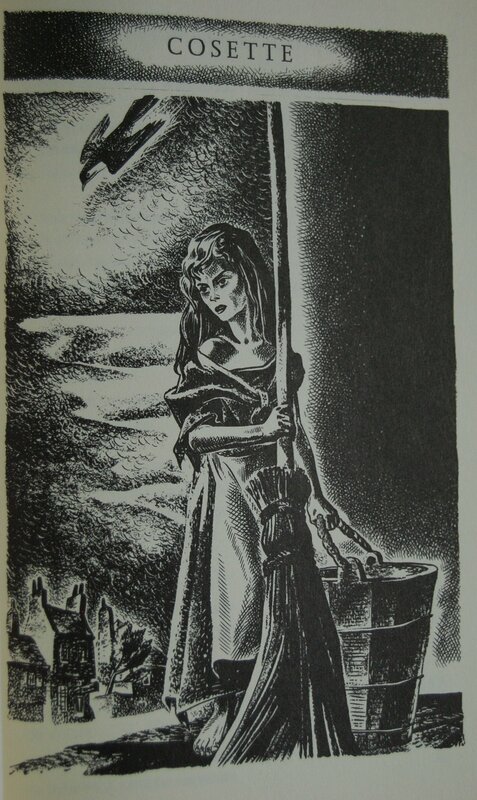 I don’t have my Heritage edition at home–it’s packed in storage and I don’t remember whether it had a Sandglass. 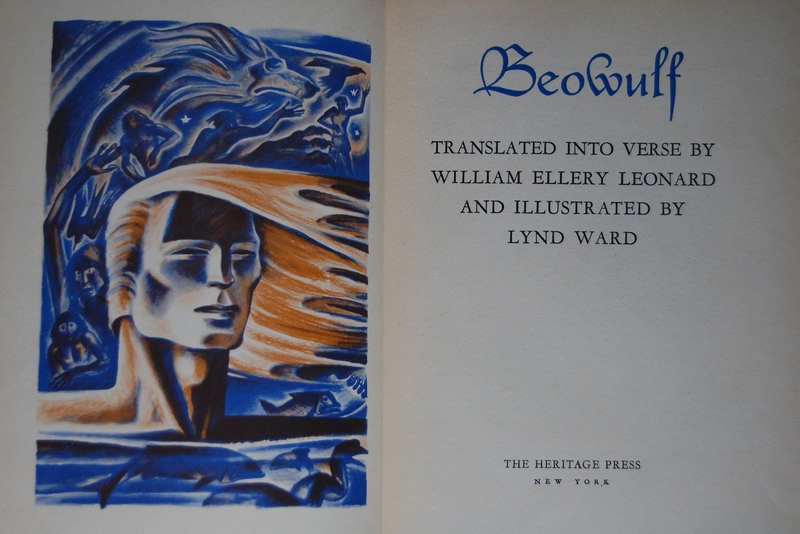 I can say that the Ward-illustrated Beowulf was an original Heritage Press publication, done in response, perhaps, to Rockwell Kent’s wonderful Beowulf for the Lakeside Press–which was the first to use Leonard’s translation. 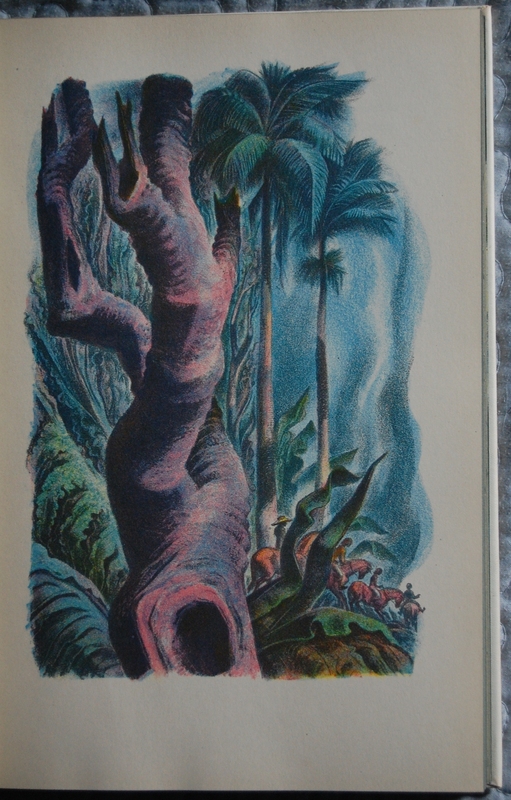 Kent’s work is justly famous, so I expect Macy felt he needed to go one better by having Ward do his illustrations in color. 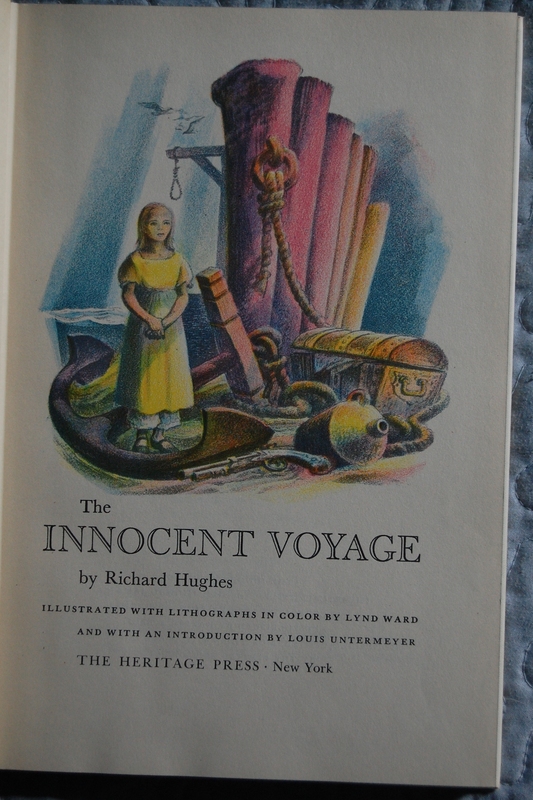 This original edition was in 1939, but from everything I have read or seen, that edition was exactly like yours–same binding, illustrations, production details–which was probably a later reissue. 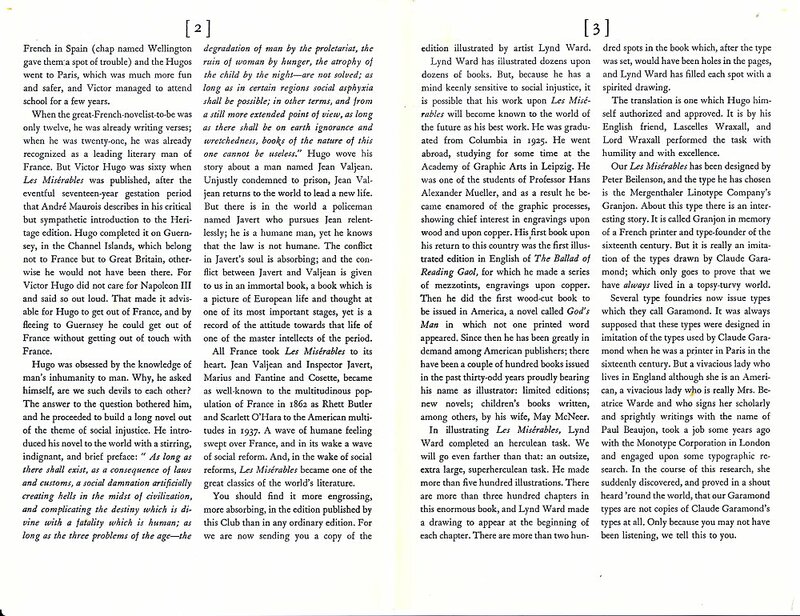 In addition to these “revisions” Ward also adapted one of the illustrations for a two-page black & white spread for the title treatment, and numerous little designs–battleaxes, meadcups, etc–reproduced in brown and sprinkled throughout the text. 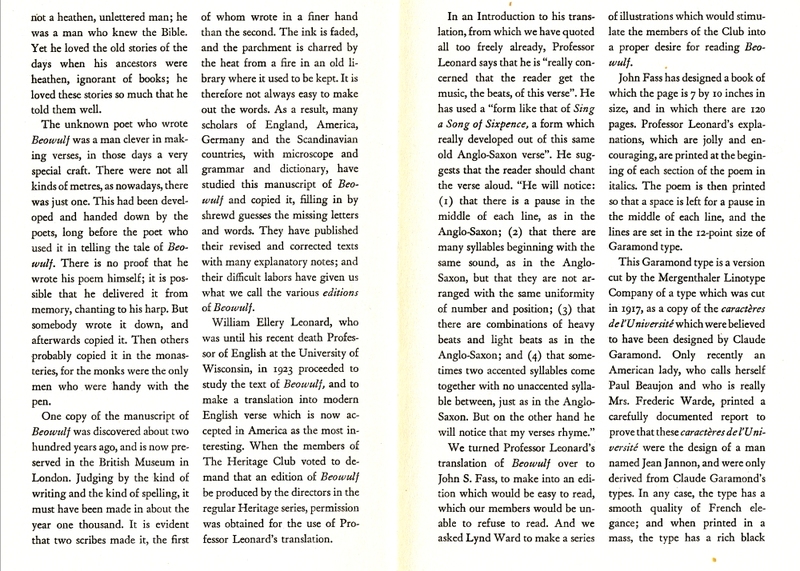 I would not say that the LEC is inferior**–just subdued whereas the Heritage original is exuberant. 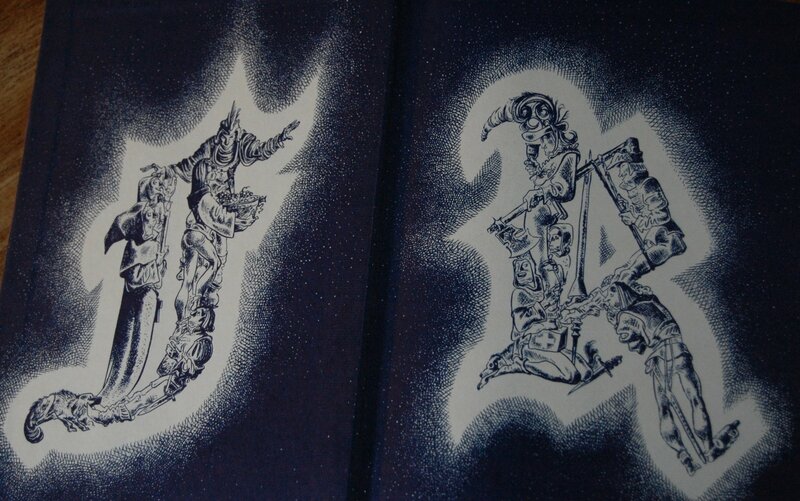 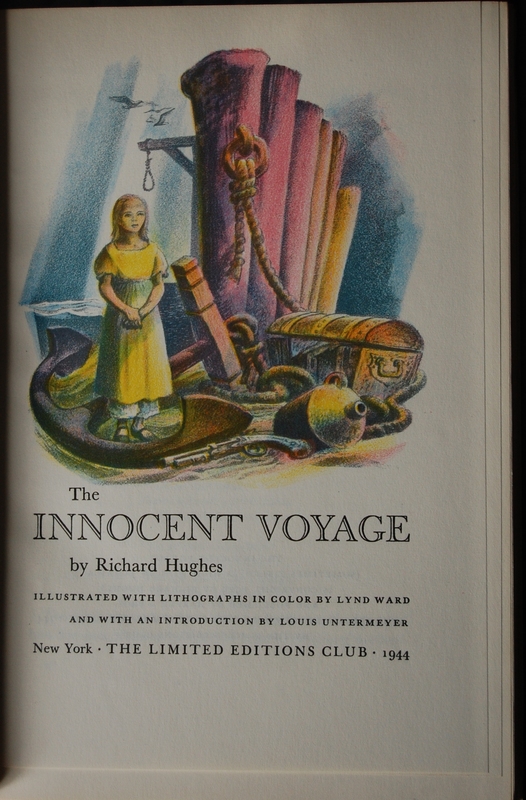 Title Page – Lynd Ward’s stunning artwork quickly lets readers know they are in for a treat. 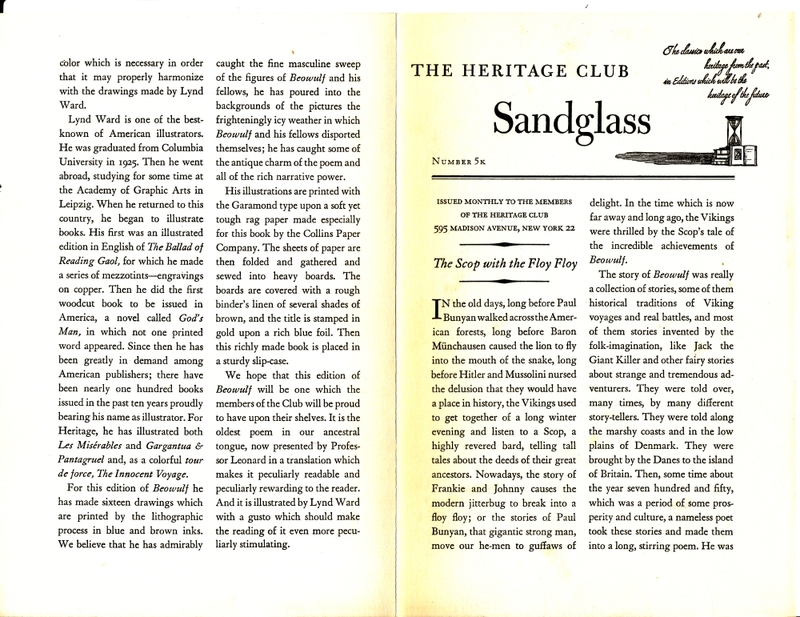 The Heritage Press acquired the rights to reprint Professor William Ellery Leonard’s introduction and translation, which was at the time deemed “the most interesting” by Americans according to the Sandglass. 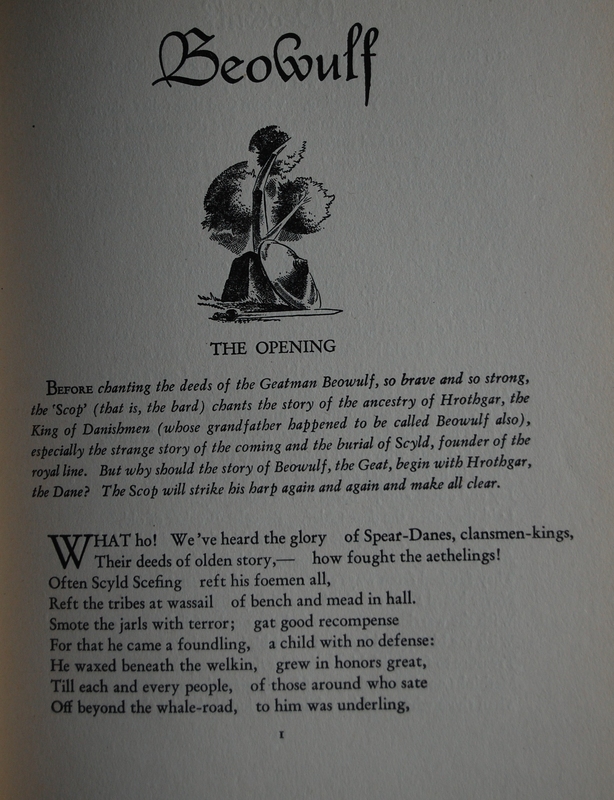 Leonard also has a preface before each section of the poem. 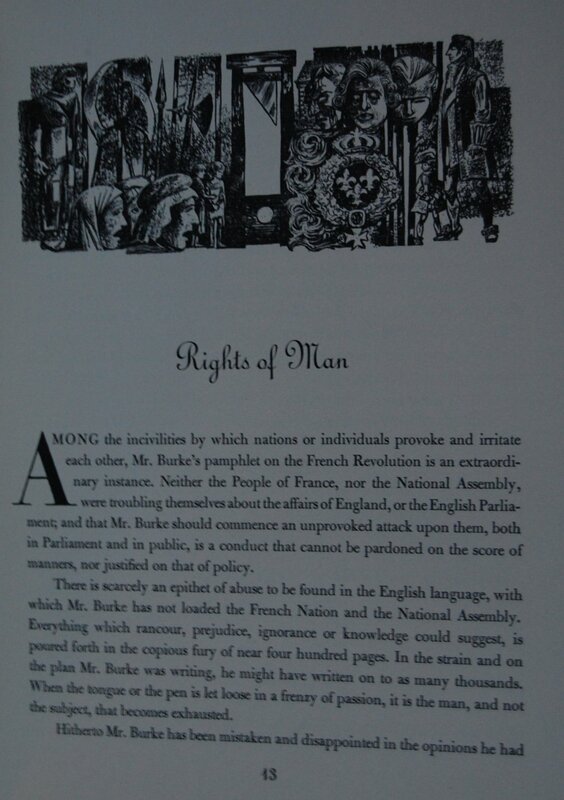 The text is Garamond, picked for its harmony with Ward’s work. 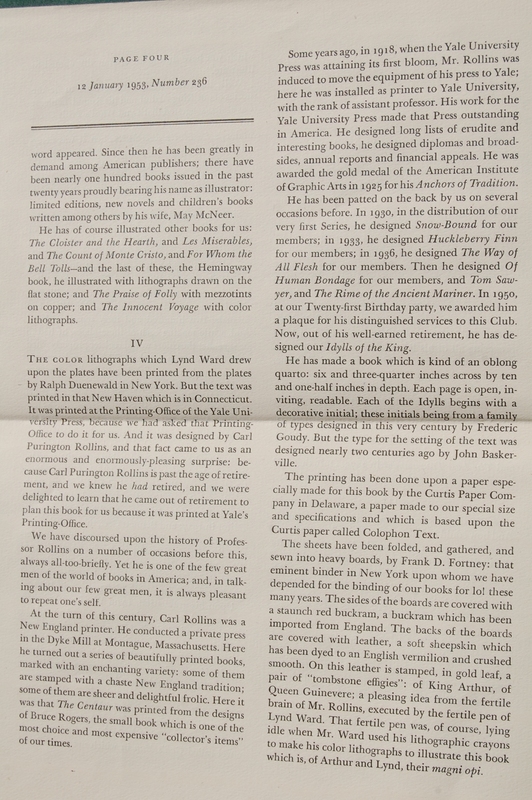 The paper was, as par the course, specially made for this book by the Collins Paper Company, who supplied a “soft yet tough rag paper” for Leonard’s words and Ward’s ink. 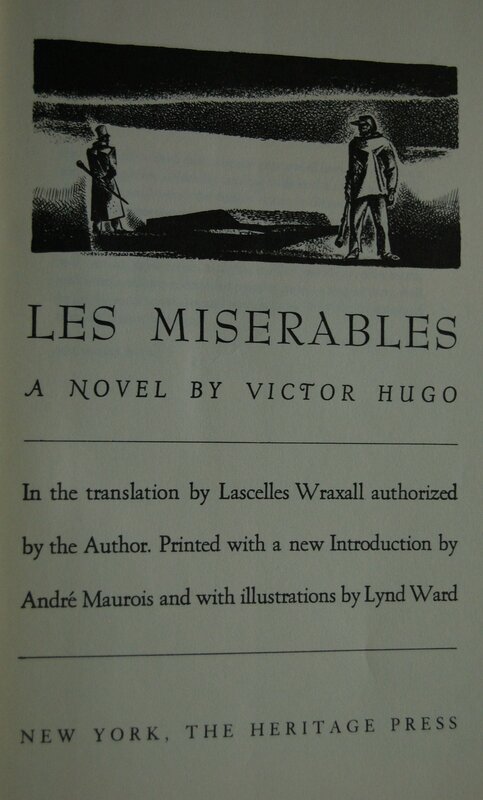 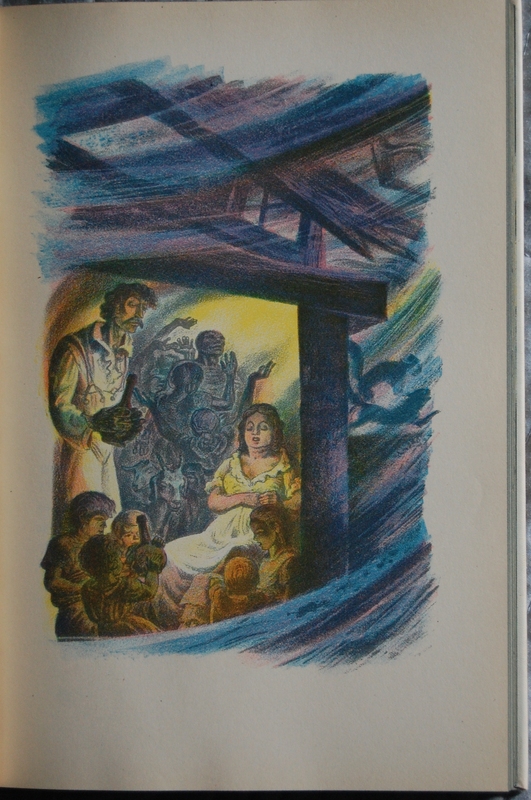 While on the subject of Ward, the Sandglass mentions three other books Ward had done for the Press by its publication – Les Miserables, Gargantua & Pantagruel, and The Innocent Voyage. 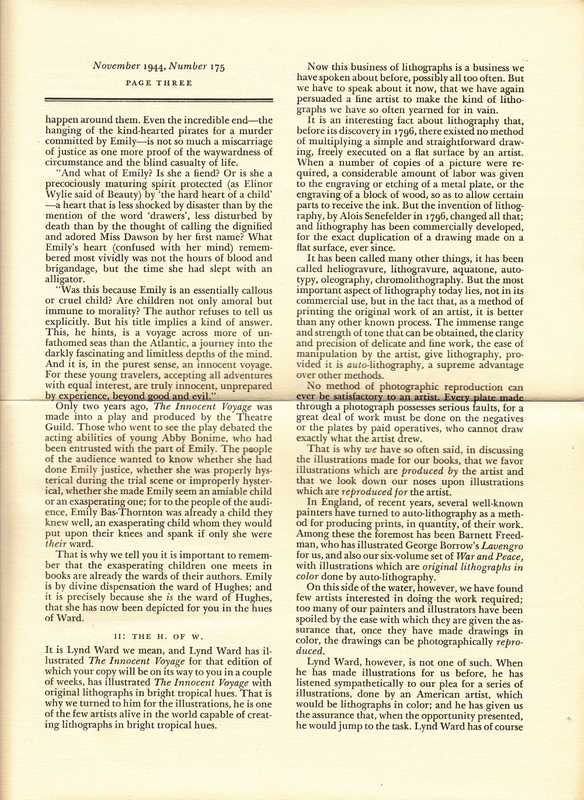 Curious that last one, as its publication date was 1944, five years after this book’s copyright page claims to have been printed. 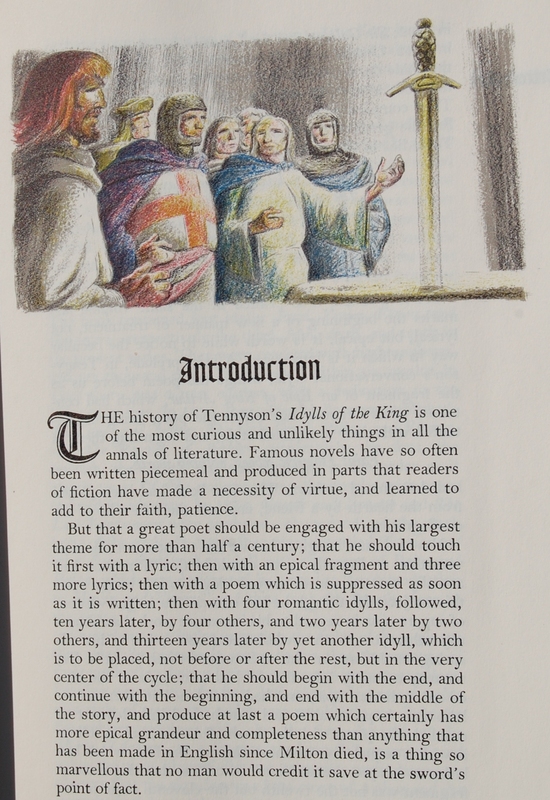 I’m inclined to believe that I do not own a first printing of this book, or it was held for five years plus before its actual release, which is possible. 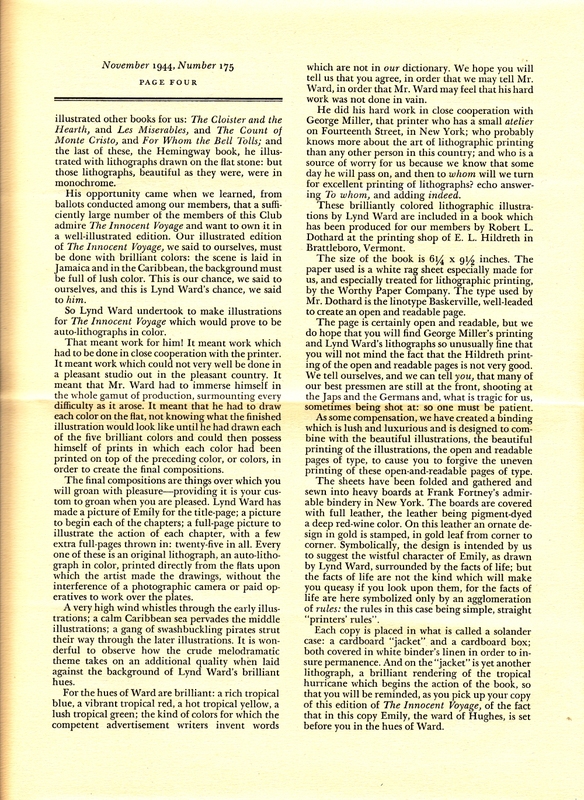 Ward’s first LEC book was not listed, oddly enough, which was The Cloister and the Hearth in 1932, but perhaps that’s omitted due to its position as an early LEC predating the Heritage Press and was not printed by them. 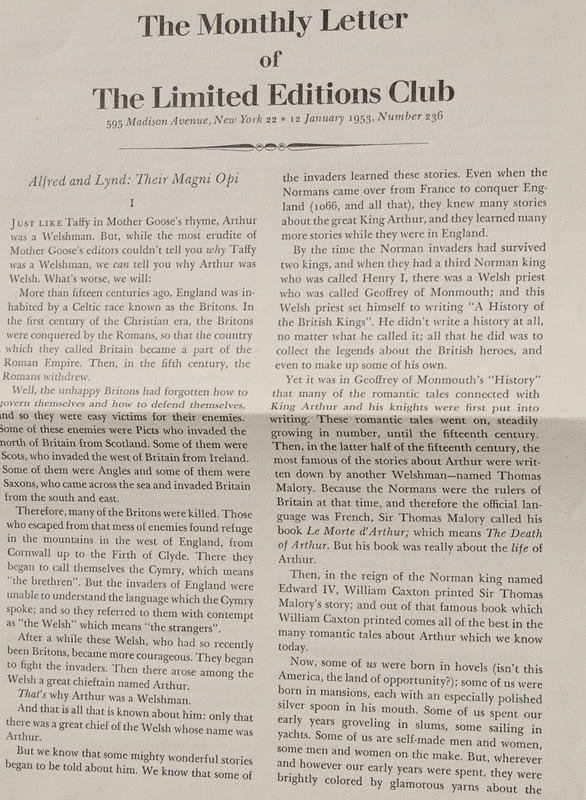 If you have any further info on this, I’d appreciate it. 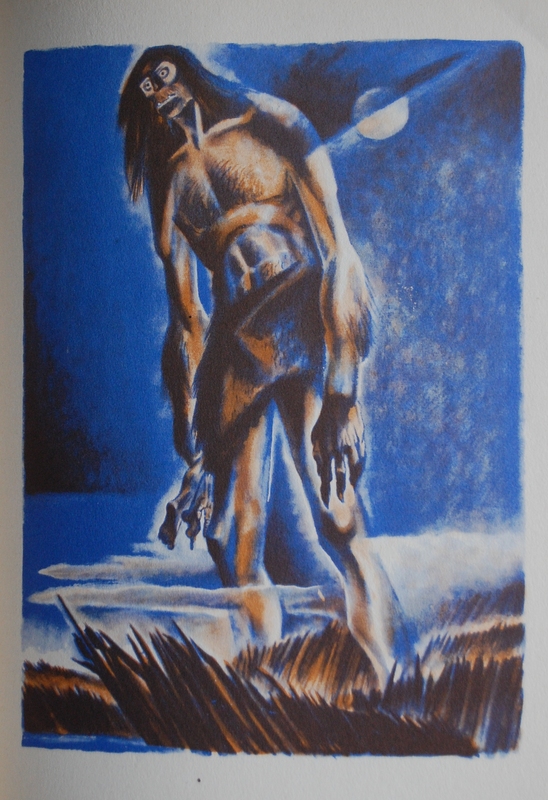 Page 5 – Grendel is grotesquely rendered here – a poignant and powerful illustration. 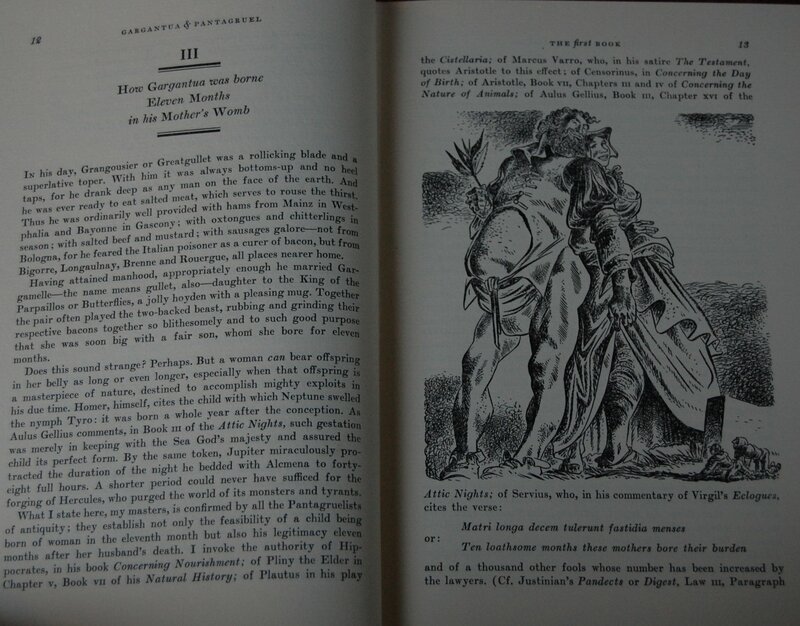 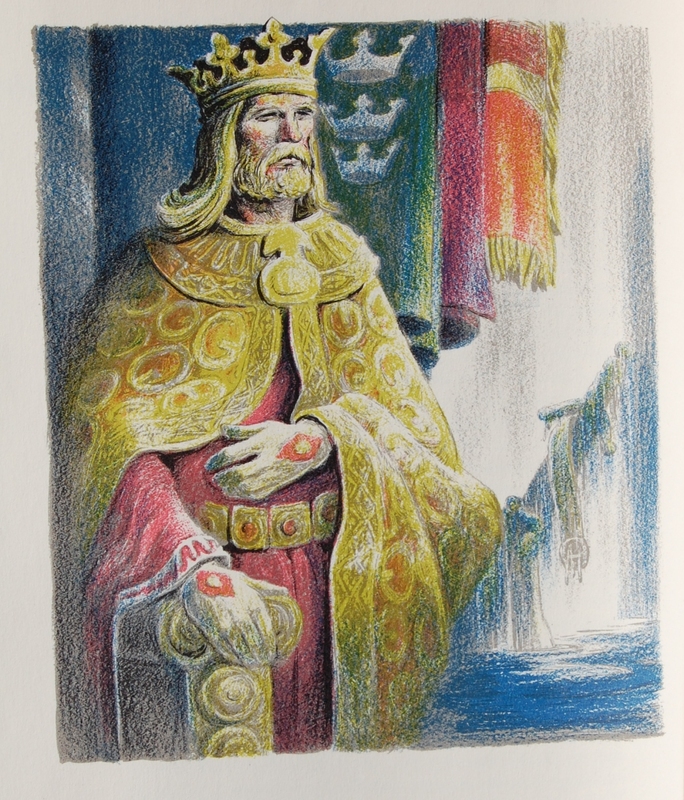 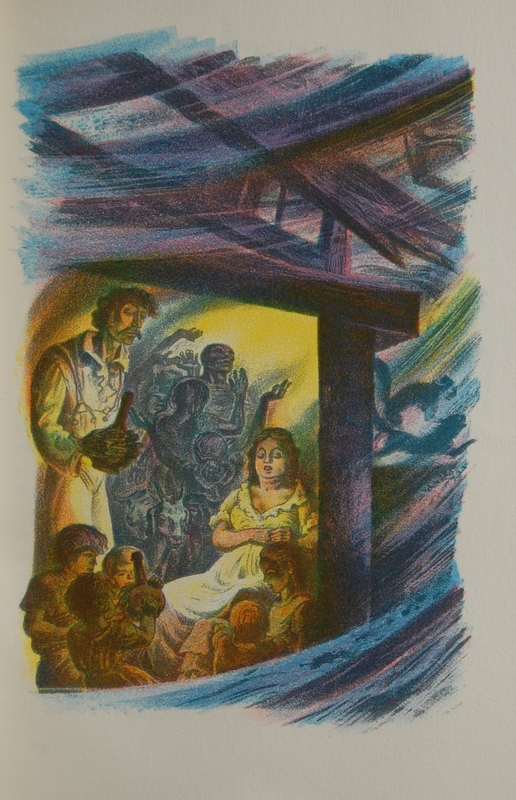 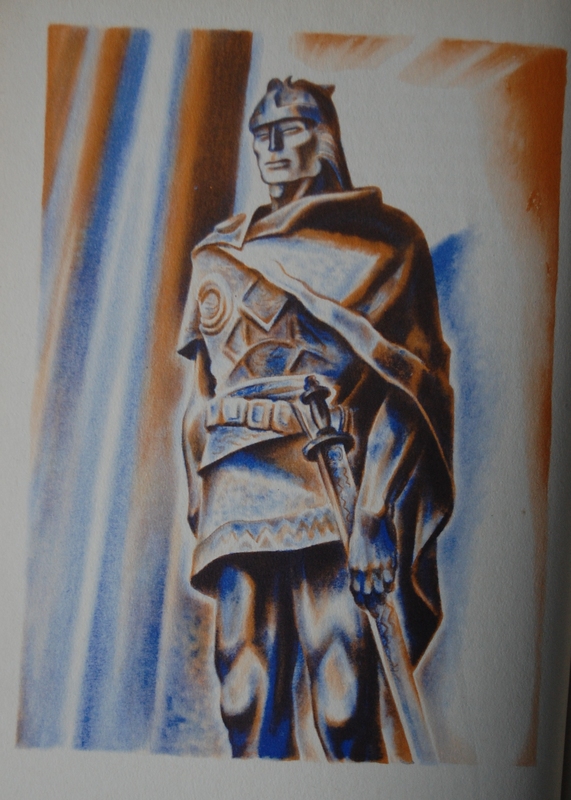 In total, Ward did 16 full-page illustrations like this one, printed with a lithographic process in blue and brown inks. 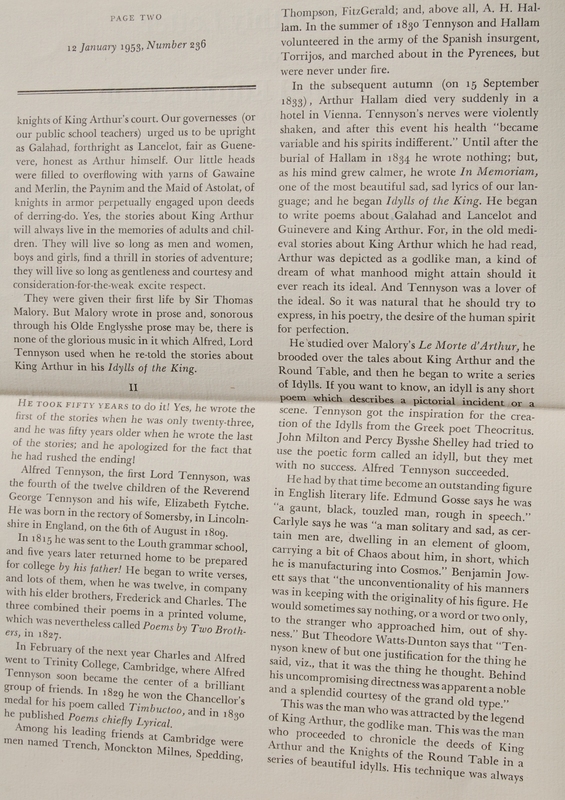 Page 8 – Beowulf gets a glorious introduction, properly playing up his heroic nature. 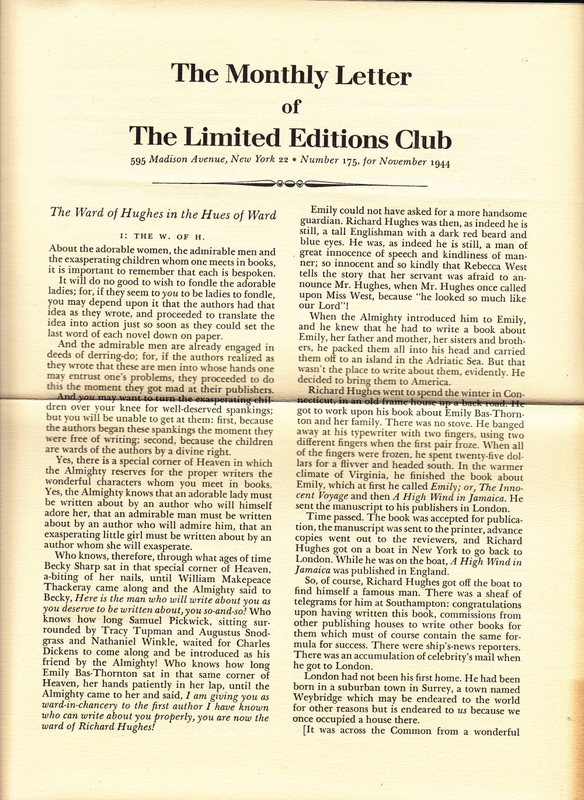 Ward was a genius. 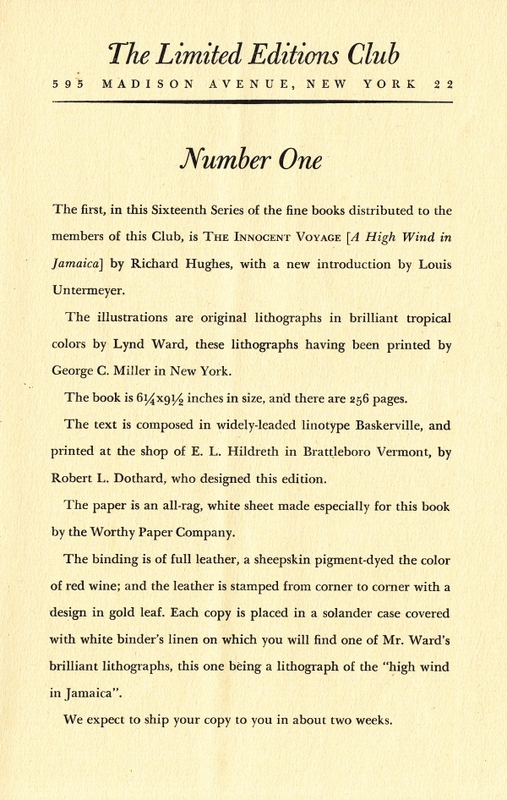 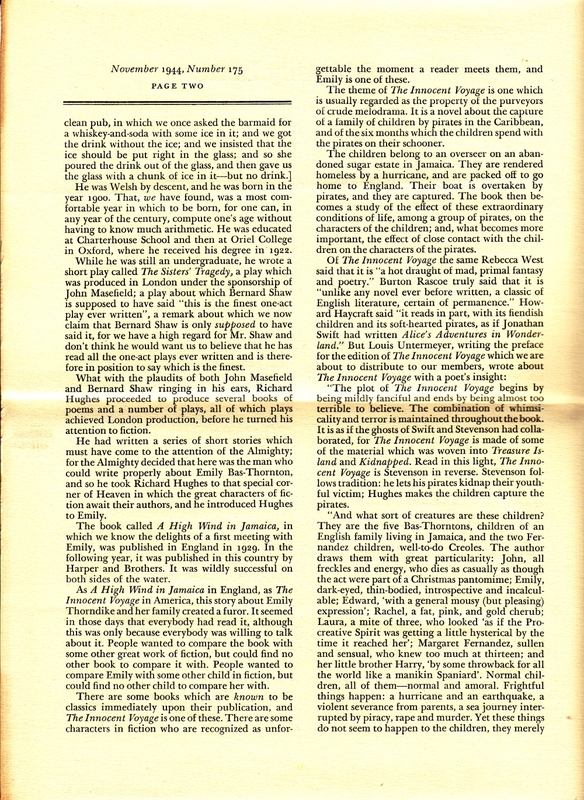 Page 1 – An example of Leonard’s introductions to each section, which Ward also contributed smaller black-and-white pieces for. 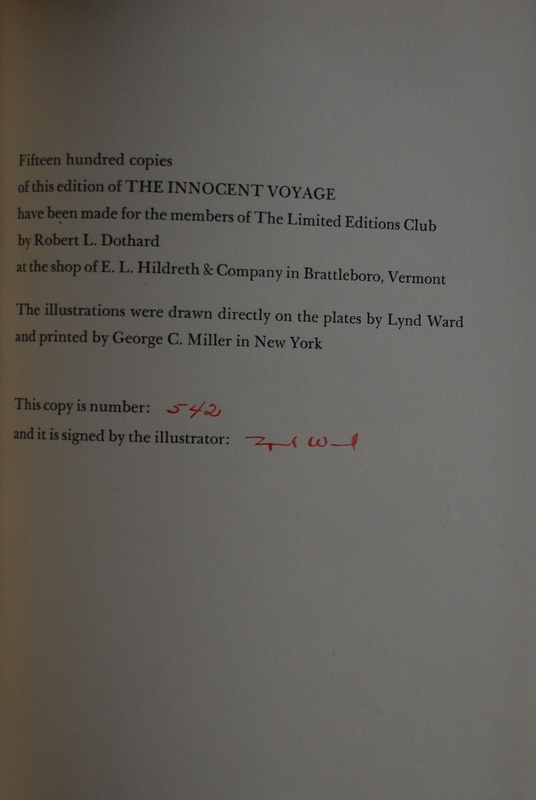 Personal Notes – I paid too much for this book. 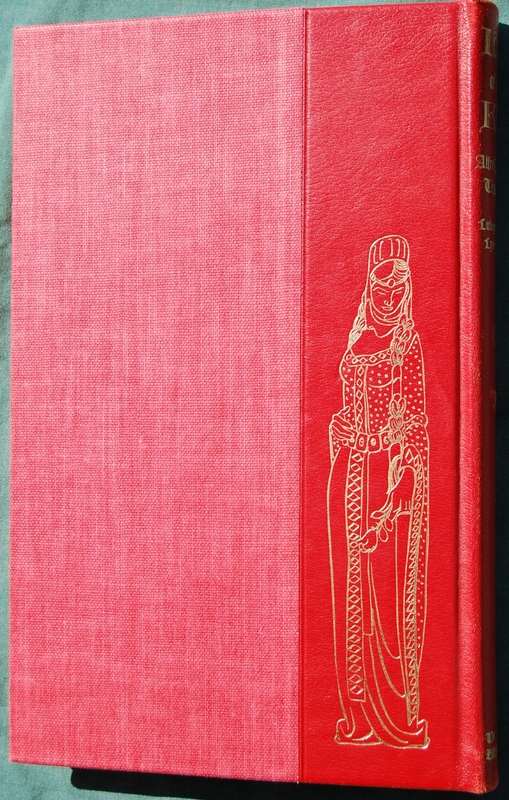 :p Before I had a clue about the Heritage Press and its price scales, I dropped $30 for this at my friend’s old Page One Used Books (the same that I’ve swapped Brownings with), but considering how rarely I see it in other shops (i.e. 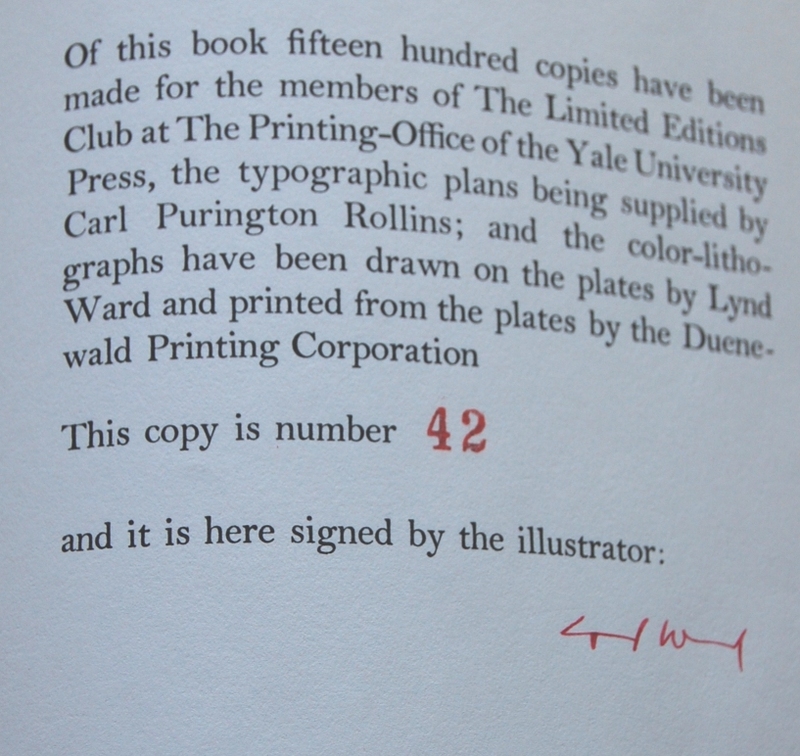 once, last time I was in Berkeley), I suppose it’s all right that I forked out a fairly hefty sum…although it is lacking a slipcase. 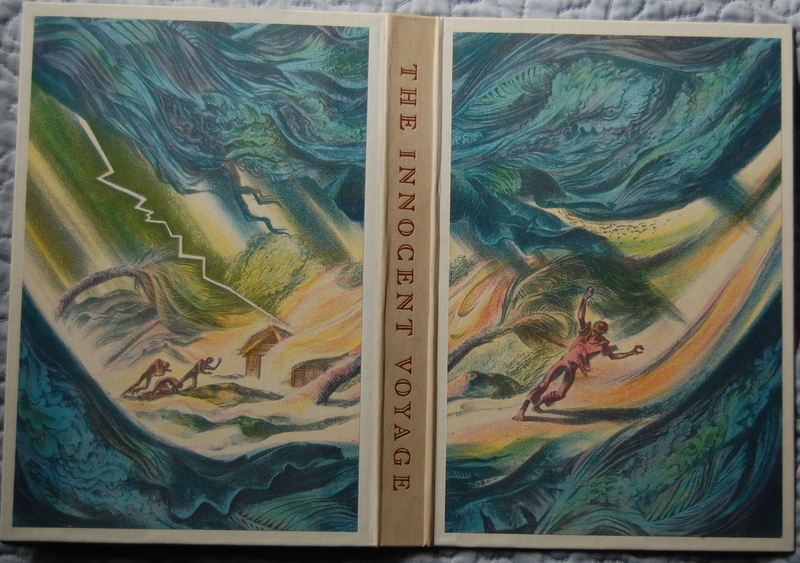 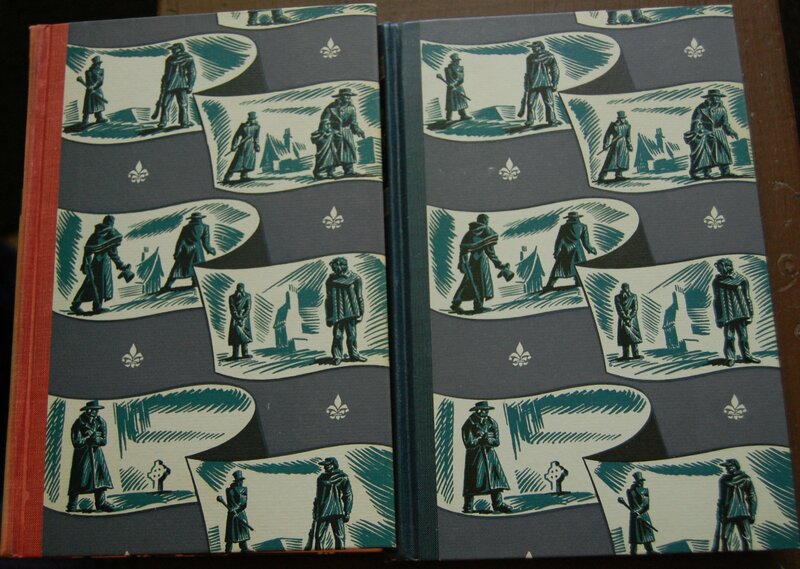 It did introduce me to Lynd Ward, one of my favorite illustrators in the George Macy Company’s long list of artists. 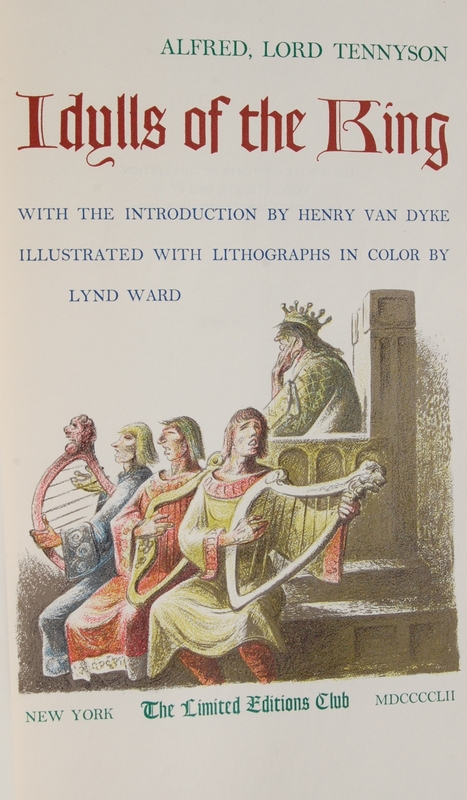 My copy came with a second pamphlet that I’d be disinclined to believe came from the Heritage Press, looking at the original Beowulf manuscript and analyzing it some. 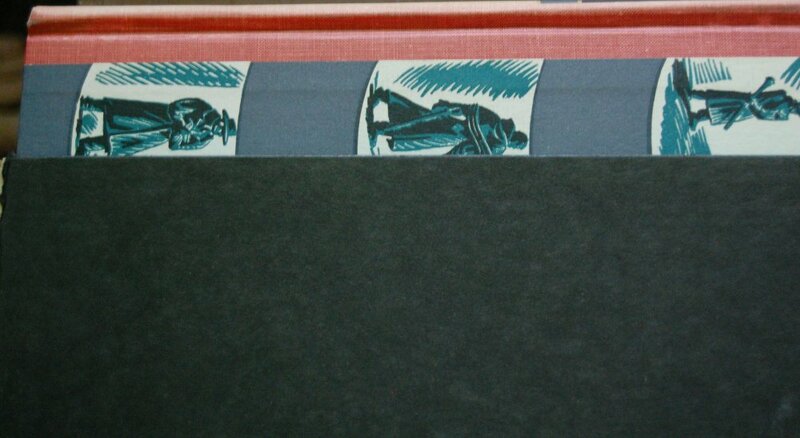 One of the neater bonuses I’ve gotten out of any book I have. 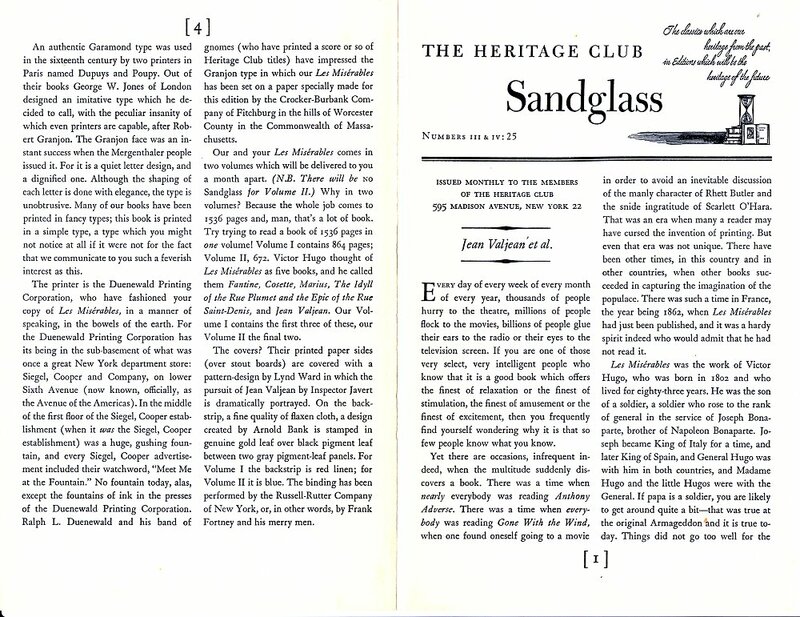 * = Due to the Sandglass listing books published after 1939, I’m not certain that I can rely on that as a publication date. 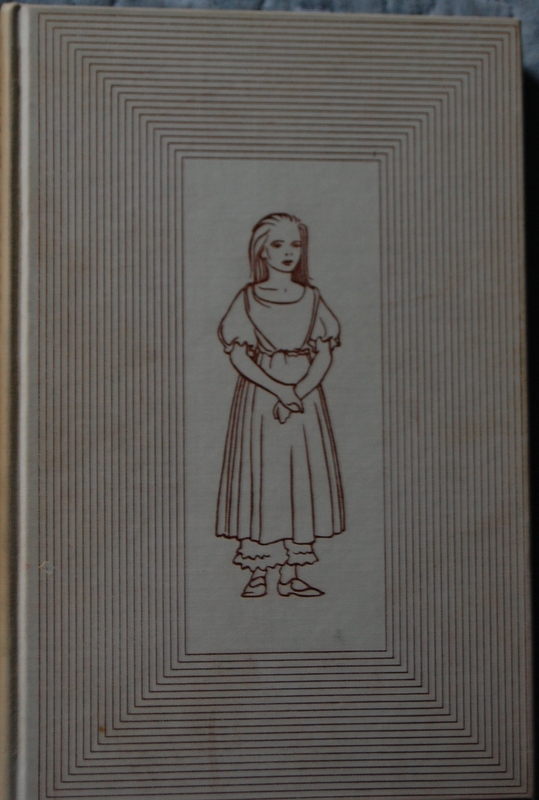 As I do not have any other year to work from, I’m arbitrarily using it as a placeholder until I know for certain what year this book was published. 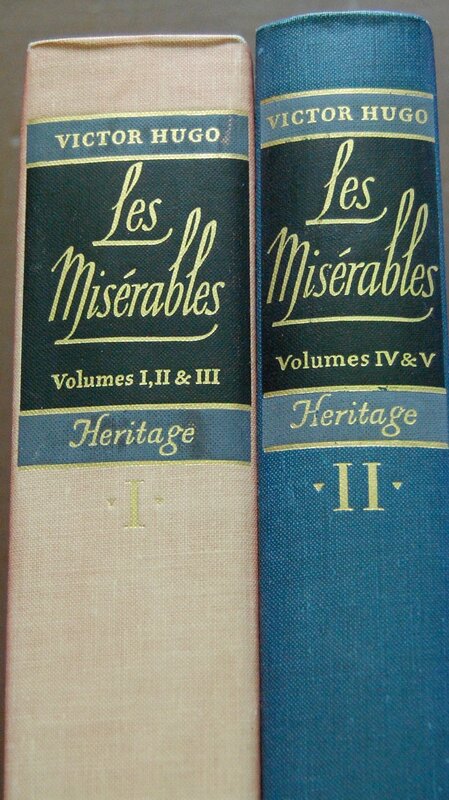 ** = Before Django supplied with me with info on the LEC, I commented that I had heard the LEC edition was inferior to the original Heritage edition. 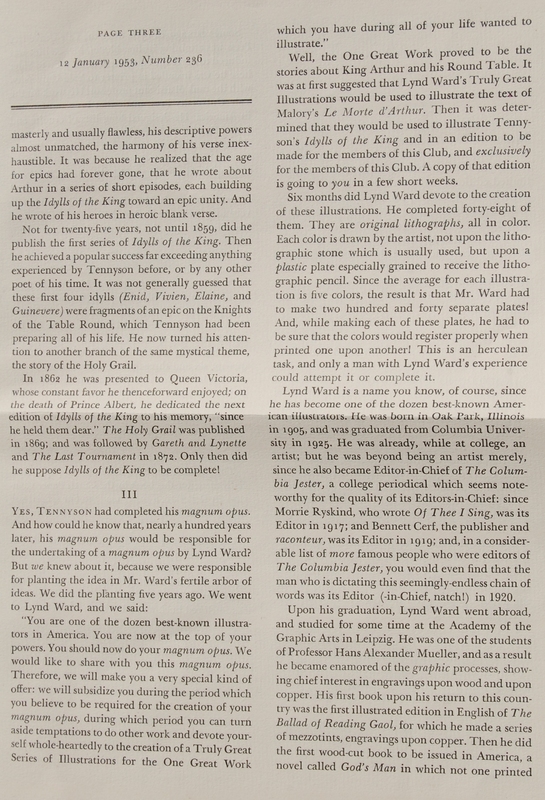 I’ve dropped those comments (since he was nice enough to provide info on the LEC! 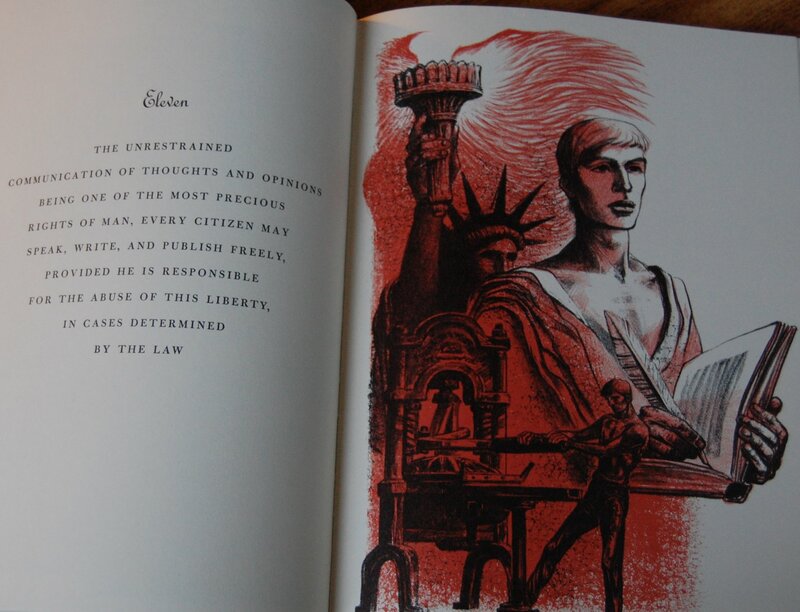 ), but that’s what he’s referring to here. 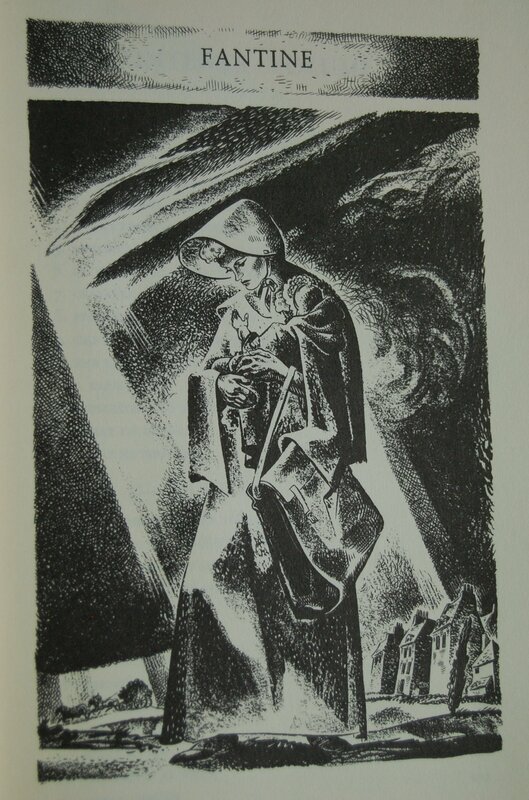 You are currently browsing entries tagged with lynd ward at The George Macy Imagery.